This week was all about lies! Why we tell lies and why we stop lying. Dae Hwi’s character also got a lot of character development. While his mother may not be the awful parent who unapologetically steals from her child, she’s still a leech. She smiles innocently when she tries to cosign him on a loan dependent on his future earnings. She smiles innocently when she steals the money he worked so hard for, promising to refund it with money she probably won’t have. As long as he’s a minor, her duty is to provide for him and she fails at it. I feel particularly bad for him because he tries his hardest and does everything right, like be responsible enough to be the class president and always be at the top of his class. But he has all these obnoxious, jealous, rich kids around him who keep telling him that his lack of a silver spoon is too big of an obstacle to overcome. And that’s just plain frustrating. 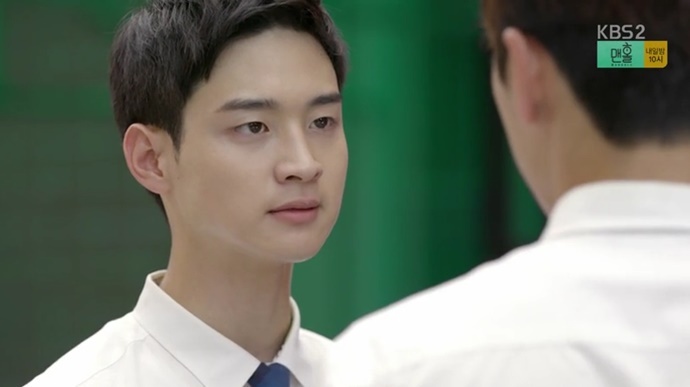 I understood his temptation to let Eun Ho and Tae Woon take the fall for him in order to keep his record unblemished. Another lie that came to a head this week was the one Dae Hwi’s girlfriend had been feeding him in the 200 days of their relationship. Like I said last week, I don’t see much love between them but lies hurt regardless and we’ll have to see if they ever reconcile and embark on a real relationship. I’m not mad at Nam Joo for being a huge fraud because she’s at an age where image is everything and a school where it could be the thin line between being popular and getting beaten up everyday. I loved the contrast between how ashamed she is of her father and how she treats him, and how Eun Ho feels about her father and treats him. But what a way to talk to one’s parent, though. I can’t even imagine what would have happened to me if I spoke to my dad like that at that age. Am I the only one sick of these bullying storylines? It’s practically mandatory to have one in every school drama and I’m getting more frustrated with each new one. Poor Bo Ra suffered the most from lies this week. Firstly, evil witch Bit Na attacked and accused her of stealing based on a previous lie her bullies forced her to tell and when caught, she turns it around and accuses her of attacking first. That pathetic female teacher witnesses it but with no one to back her up and Bit Na’s army of lawyers against her, Bo Ra lies and confesses to starting the fight, earning herself a week of suspension. Forget the teacher but at least a dozen students witnessed the fight. Why didn’t one come forward? Or even pull out a phone and record the incident like they are inclined to do? I’m sick of watching this poor girl getting bullied and need it to end ASAP! One problem I have with a lot of dramas is that they start off pretending the main female character is the lead till it switches and the guys drive the story. So while Eun Ho got a lot of screen time this week, most of it was to drive Tae Woon’s story which was about him lying to his heart. It’s been pretty obvious that he has a thing for Eun Ho and he finally understood it this week. It was cute. We saw them spend a lot of time together, he’s her only webtoon fan, and he spends way too much on chicken he doesn’t eat just to see her. Speaking of which, why is she telling him to STOP buying the chicken? Granted, it will save her from numerous trips to his place but her family is still making money, right? Last but not least, as mentioned, Eun Ho isn’t really driving the story these days so not much happened with her. Her cover-up was more about Dae Hwi than her. And of course, she’s the object of Tae Woon’s affection. One thing to note, though, is that her lie is creating a rift between her and her best friend. They barely spend any time together as she’s always with Tae Woon and even when they are together, she’s hiding things from her so I’ll like to see how their story will play out. On another note, it’s kind of funny how I was thinking that this was the rare drama that the actor playing the sports teacher isn’t a jerk and boom! He’s suddenly cockblocking Mr. Shim. 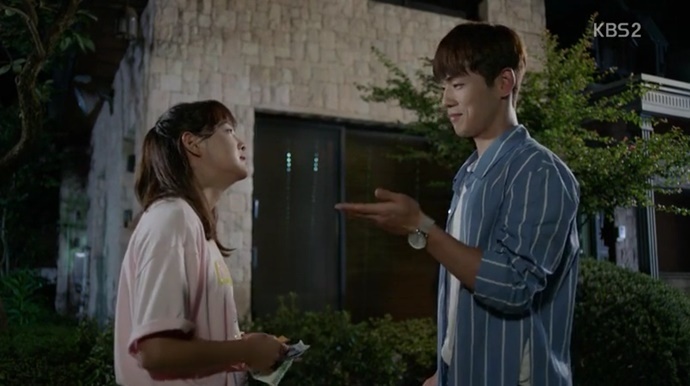 Anyway, these were two fun episodes and I can’t wait to see what else they have in store for us like are Eun Ho and Tae Woon going to kiss? Is he going to immediately reverse his confession that she makes his heart race? Will Dae Hwi get desperate enough to let that pathetic, rich kid score higher than him in the next test? Please don’t! Will someone protect our dear Bo Ra and stop those ugly bullies from touching her? Will someone end Bit Na already? So many questions and luckily for us, we’re only at the halfway point so there’s still lots to see.